In most years, issuing permits worth $225 million in construction value would go down as a banner year in Missoula if not for one factor: the prior two years were even higher. As the Missoula Public Schools bond and the renovations and new construction it generated come to a close, the large projects that drove the value of building permits in Missoula to a record $277 million in 2017 may begin to diminish. But Mike Haynes, director of Development Services, said several large projects could still move forward in 2019, and if they do, it could continue what’s been a solid three years of development in the Garden City. 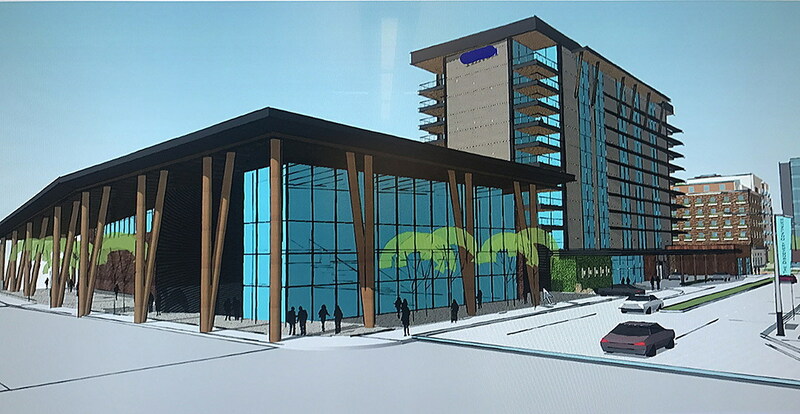 A rendering of the planned hotel and conference center at the Riverfront Triangle in downtown Missoula. The Riverfront project is now years in the making, dating back to 2011 when a group of developers won exclusive rights to redevelop the vacant corner at Orange and Front streets. The project has since expanded in scope and now includes a proposed 10-story hotel and conference center, an underground parking garage and seven acres of commercial, office and housing. The developers said in October they intend to seek building permits this spring, and Haynes expects they’ll bring the project to fruition. Other significant downtown projects also could go for a permit this year, including the AC Hotel, proposed for the corner of Pattee and Main streets. Developer Andy Holloran of HomeBase Montana told the Missoula Current last month that he intends to begin construction by June. Haynes also confirmed plans for the corner. 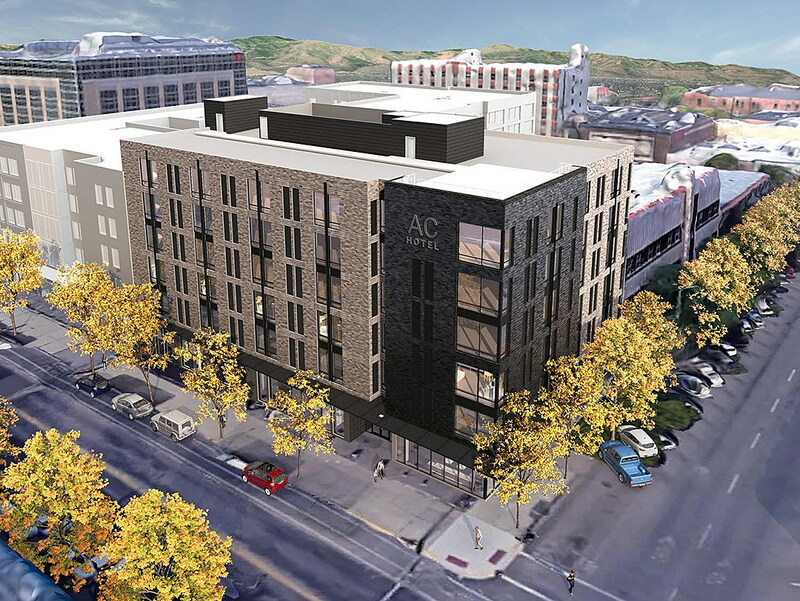 A rendering of the AC Hotel planned by HomeBase Montana this spring in downtown Missoula. Several large downtown projects will wrap up this year, including the Roam student housing project, estimated at $26 million, and the $40 million Mercantile hotel, which opens next month. The Missoula Public Library is set to open next year and is well under construction. Haynes described the pace of development across Missoula over the past three years as healthy and stable and in accordance with the city’s inward growth policies. The pace of new projects marks a turnaround from 2014, when the construction value of permits didn’t top $120 million. 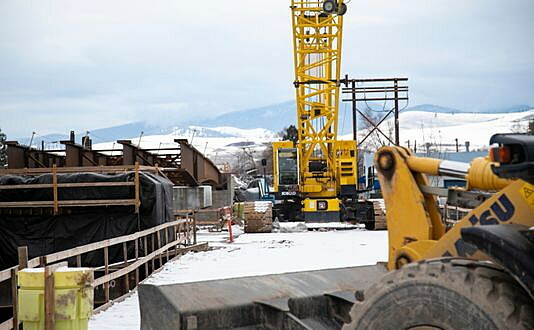 But as the economy improved and as Missoula’s population has grown, the value of the city’s construction permits has risen. In 2015, it reached $190 million before the two record years of 2016 and 2017, which saw permits valued at $245 million and $277 million respectively. Haynes expects to see residential activity continue this year in 44 Ranch and Linda Vista. The Old Sawmill District will remain a commercial hot spot, with several new projects on tap this spring. Missoula International Airport also is expected to break ground on its new terminal project. The city recently annexed 3,200 acres west of Reserve Street, including the Missoula Development Park. Haynes expects to see a number of projects there go for a permit as well. A rendering of the new passenger terminal at Missoula International Airport, set for construction this year. Three of the 10 largest projects permitted in 2018 were school related, including a $14.7 million renovation of Sentinel High School and an $8.3 million addition to Meadow Hill Middle School – both funded by the Smart Schools 2020 bond. The largest privately funded commercial projects last year included the $13.4 million Stockman Bank building on Brooks Street and a $4 million ambulatory surgical center on Mullan Road. In comparison, the new AC Hotel this year will carry an estimated construction value of $21 million while the Riverfront Project could ring in at $150 million, according to developers for both projects.